Good morning! How'd ya like that sneak peek on Gina's blog today? I am so stinkin' excited to share the full reveal of all the images in my newest set, a follow up to one of my personal faves and best sellers, Pretty Patterns 2! But for now, a look at this pattern I've been so obsessed with for awhile, that is so hot on textiles, signage, stationery, crafting and even quilting. 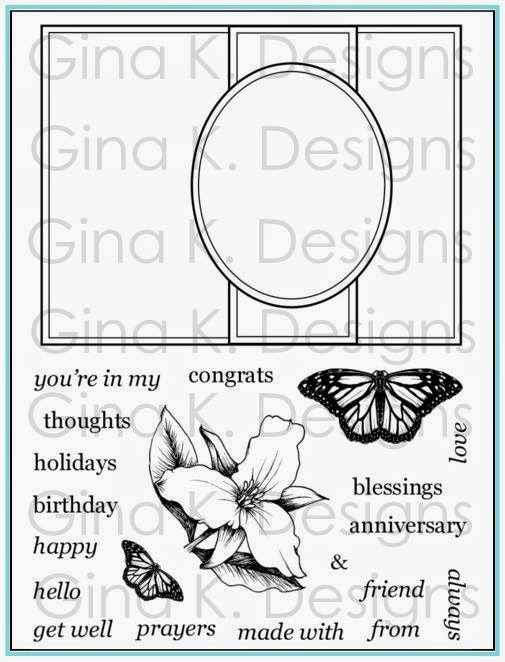 It looks so clean and fresh on cards, and I am so happy to be able to create these patterns in any colors I choose! There are so many ways to customize them, too, if you wan to add more color with smaller elements included in the set, I'll be sharing examples of those at the party and in our hops! Here is a simple sample (that also gives you a peek of Carolyn's new set, tune in tomorrow for a sneak peek snippet from that set!) 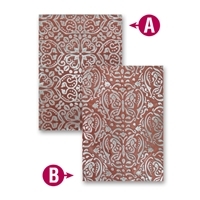 Patterns are stamped in Gina K. Innocent Pink and Red Hot on Pure Luxury White. Base is Pure Luxury Dark Chocolate. 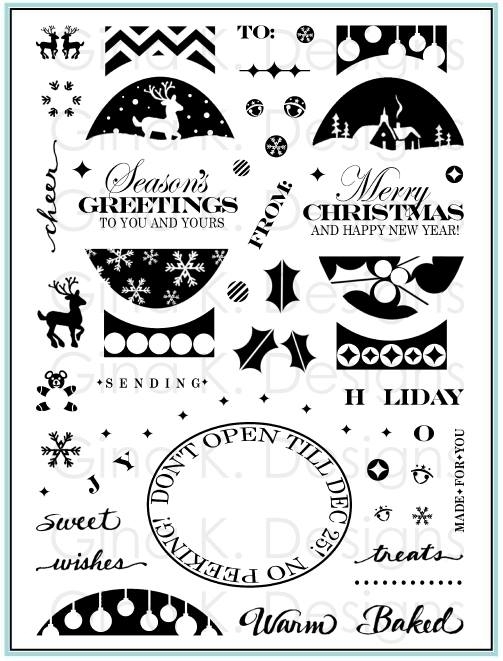 Only 3 more sleeps til the party and new stamps, can't wait wait!! 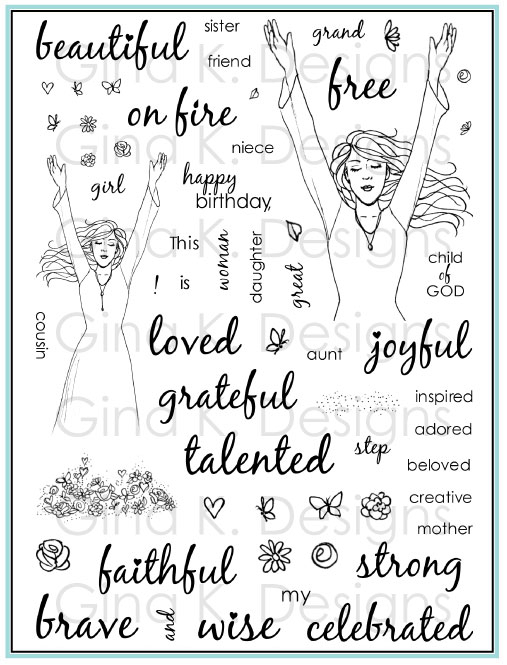 I love how beautiful and professional their dies always make my stamped images look, and how special the finished card or project ends up being. Supplies used: Stately Flowers 1 stamp set, Pure Luxury White and Powder Blue cardstock, white oraganza ribbon and adhesive pearls from Gina K. Designs, Memento Tuxedo Black pad from Tsukineko, Copic markers, Butterfly Kisses M-Bossabilities EL- 024 and Labels Twenty Nine S5-156 from Spellbinders . Spellbinders has provided a wonderful package of brand new dies and embossing plates used on the card above, PLUS the ones you see below!) for one lucky reader, so that you can use the same products I showed today (as well as few more!) 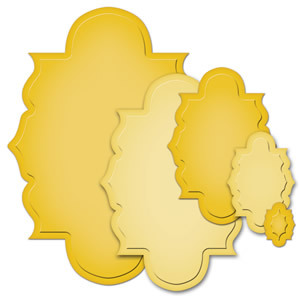 to recreate this project and come up with your own wonderful die cut projects. by leaving an answer in the comments section below. For a third chance, sign up to follow my blog! Thanks for participating, tell your friends, and good luck! I will announce a winner Wednesday. 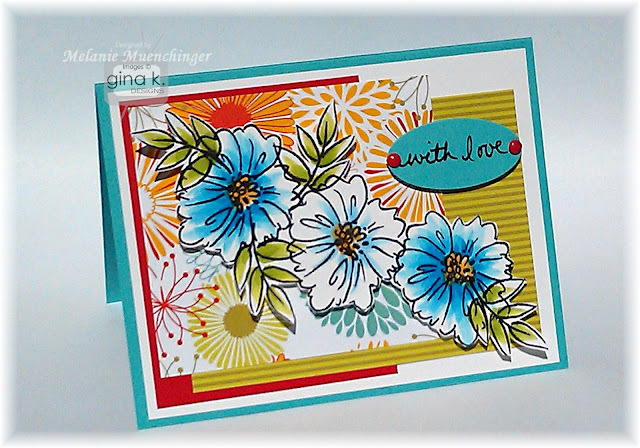 Good morning and thank you for joining us today for a fabulous joint blog hop with the CardMaker and Gina K. Designs/StampTV design teams! Today we are working with the new Spring Parade StampTV kit. 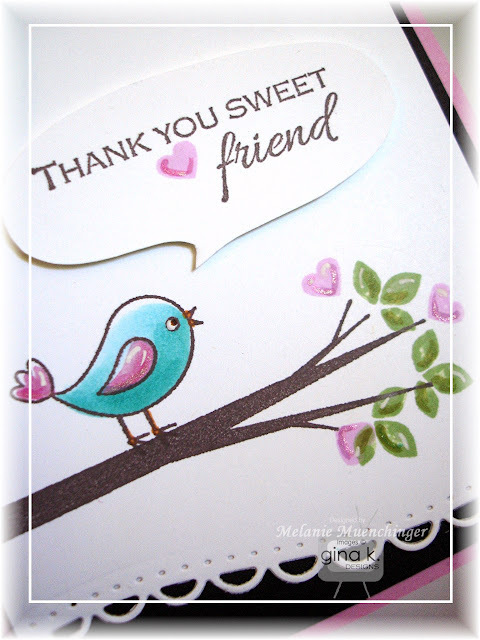 I love all the colored cardstock and patterns in this kit, but since I have done several posts using those colors and papers already, and I know you will probably see several using them during the hop, I went with a different color palette of Pure Luxury colors, and the one mini stamp set I have not yet worked with in the kit, Sweet Friend with this cute birdie and branch. I used my Copics to add a few accents to the hearts and leaves and Sakura glitter pens for some sparkle. I hand cut the sentiment with scissors to create the speech bubble. Green ribbon is also included the kit. Supplies used: Spring Parade Stamp TV Kit, Pure Luxury Bubblegum, Dark Chocolate, and White cardstock, green organza ribbon, Memento Rich Cocoa, Bubblegum and Grass green ink pads, Copics, Sakura glitter pens from Gina K. Designs, Copics, Spellbinders A2 Curved Borders One. this one being from Gina K herself! Pin it to Win it Blog Hop! 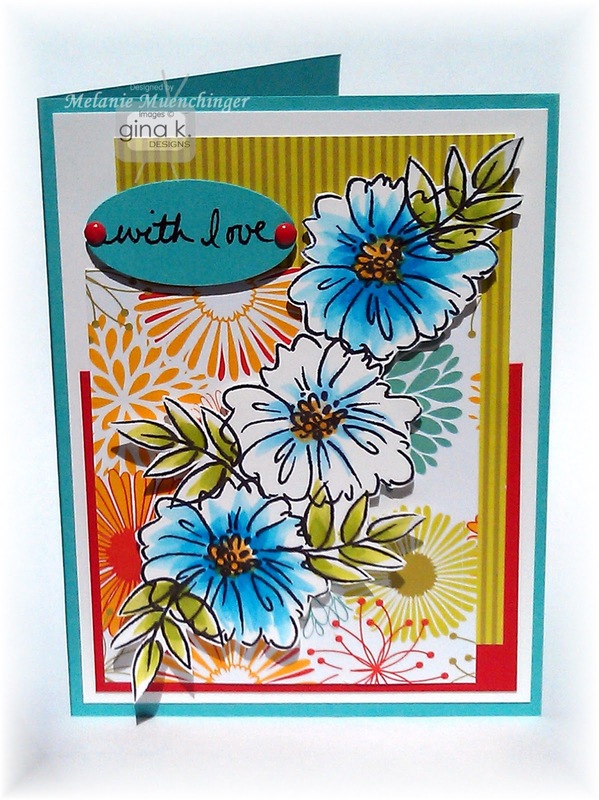 Welcome to the Gina K. Designs "Pin it to Win it" Blog Hop! 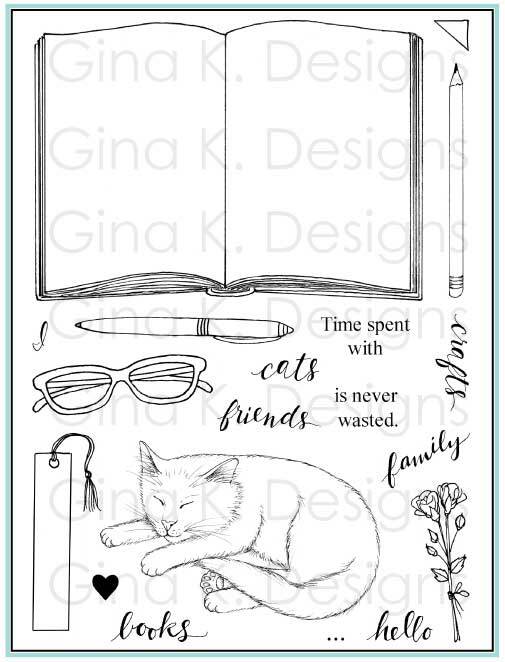 Today, the Illustration Team has put together a special hop featuring many of our beautiful new stamp sets enhanced by the Gina K. Designs patterned paper! As you visit each blog, "Pin" the project to one of your Pinterest Boards and use the words, "Gina K. Designs" in your description. 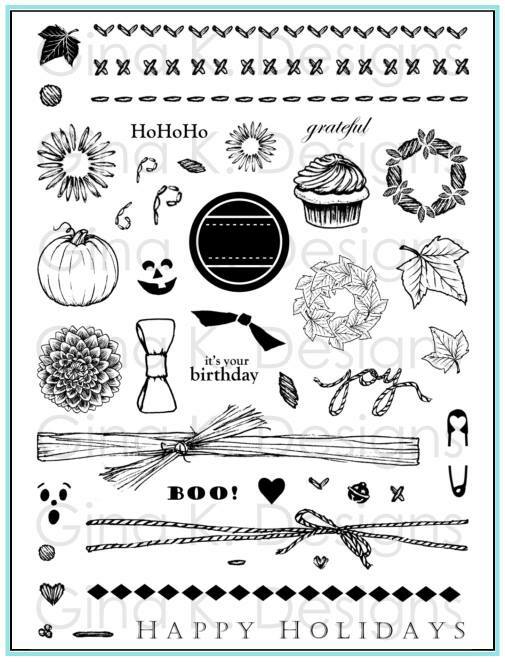 We will search Pinterest for your pins and choose 3 winners who will each win a fun grab bag of stamps, patterned paper and embellishments. Don't have a Pinterest account? That's okay! Leave a comment on each blog and we will choose 3 winners from all the comments, too! Wanna' do both? 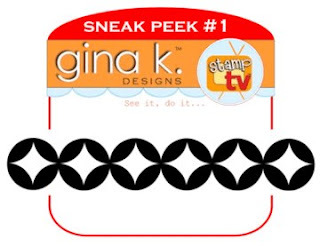 You'll double your chances of winning some fun Gina K. Designs stamping goodies! 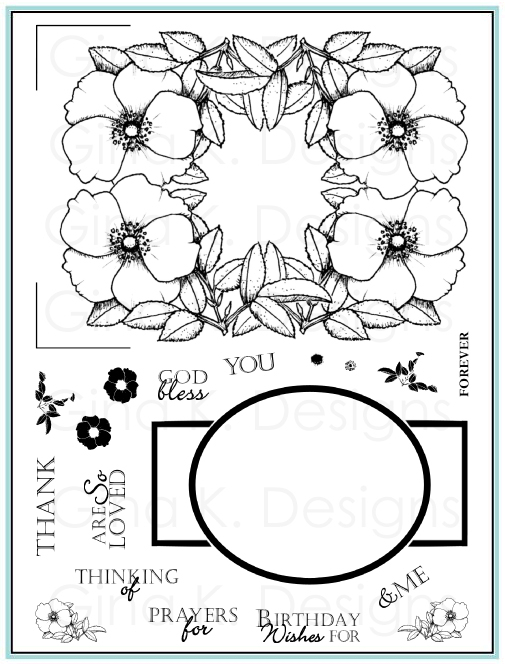 I love how this turned out, and am so glad I had a design from the book to help me since we had company in town this weekend and my mojo has been thrown off the last couple weeks.I also turned it on its side and turned the sentiment tag to share how nicely this layout also works landscape style. 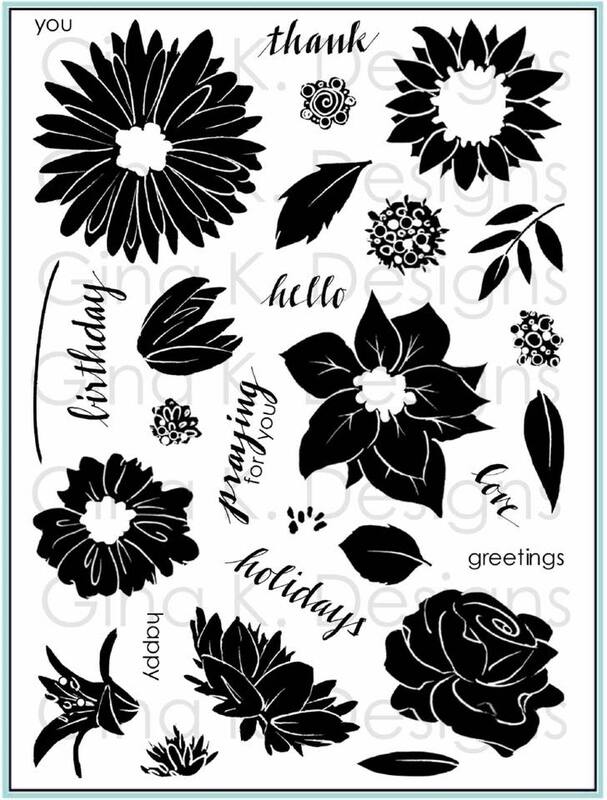 AND, from now through Tuesday night, Gina K. Designs is running a special sale- 50% off all stamp set duos, including 6 new ones AND 25% off ALL Gina K. Designs 6 X 6 Patterned Paper packs. Don't miss out on this great sale! What a sale! Are these new duos cute or what? Be sure to browse all the sale duos and new sets and then bring your total up to $50 or more free shipping, such a deal! Don't forget to throw A Year of Flowers 2 in your cart if you haven't already! Thanks so much for all the birthday wishes, it has been a crazy busy but fun week with lots of relatives vistiing. Week 1 down with the cast, 2 more to go! What a week! 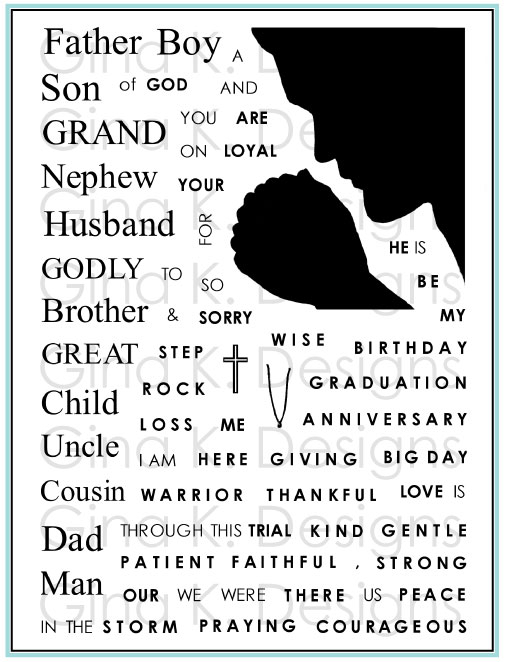 Well, I turned 40 today, cough, but have barely had a chance to plan anything fun or prepare for this milestone or reflect on years past because my younger son William fractured his elbow Tuesday night, poor sweet child! First time we've been to the outstanding Dell Children's Hospital , ever, never needed an x-ray for either boy before this. Ever. I'll have to stop bragging now that my husband's fine, strong German stock has given my rough and tumble boys unbreakable bones (as well as the Lord's protection of course). To add to the drama, unbelievably, someone rear-ended William and I when we were on our way to the hospital for x-rays! William blurted out, "Did someone just HIT us?? I'm going to have bad dreams tonight for sure!" :( (The first time I have been involved in an accident in more than 6 years, the last being when both boys were in the car with me and someone ran a red light and broadsided us in the intersection.) Anyway, there have been many tears shed, but I think we are turning a corner with the pain being managed pretty well now by meds, and today we go to get the permanent long arm cast from the orthopedic pediatrician to replace the splint from the ER. Happy birthday to me!!! 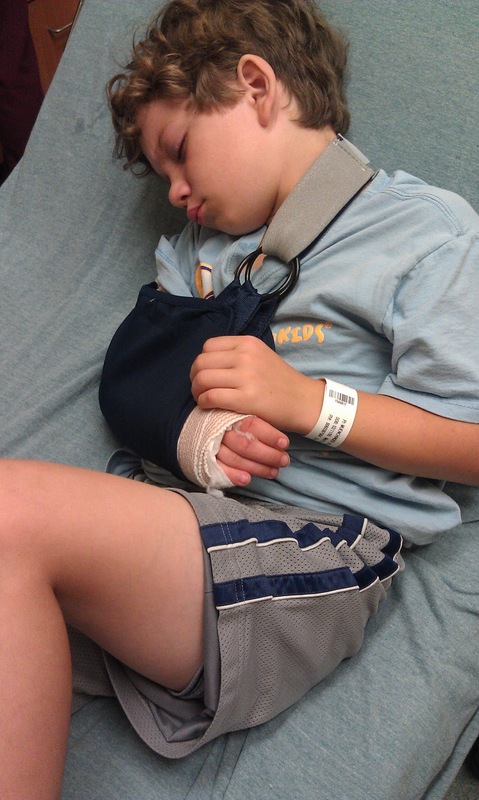 This photo is of him just after they wrapped it, passed out at 11 PM, waiting to be discharged. We are really hoping for waterproof glow in the dark something super cool for his cast, or at least William's "light blue" request. He got to convalesce with me at home Wednesday and stressed about returning to school Thursday, but, of course, his friends gave him tons of love and attention are clamoring to see the new cast and sign it. 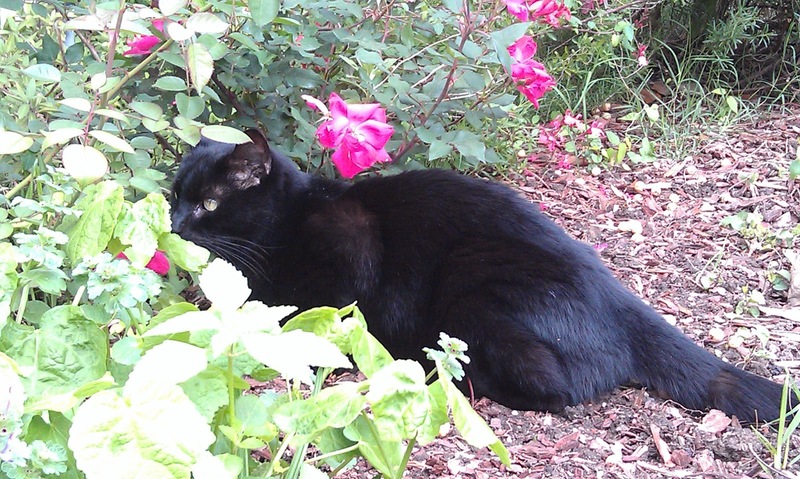 Homey update: after almost two weeks of corticosteroids and a new found appetite, he really has a new lease on life! He’s always in the same room I’m in now, and he came outside on Saturday with us in the backyard and hunted in the bushes and ate a lizard. He got in my lap on his own the other day. He lays on the kitchen floor when I cook dinner and next to the dining table while we have dinner. I'm taking pictures of everything, kind of like a brand new baby with all the first (that seem like "firsts" since it s has been months since he's been doing all these things we've been taking for granted). StampTV Kit Spring Parade Available Now! 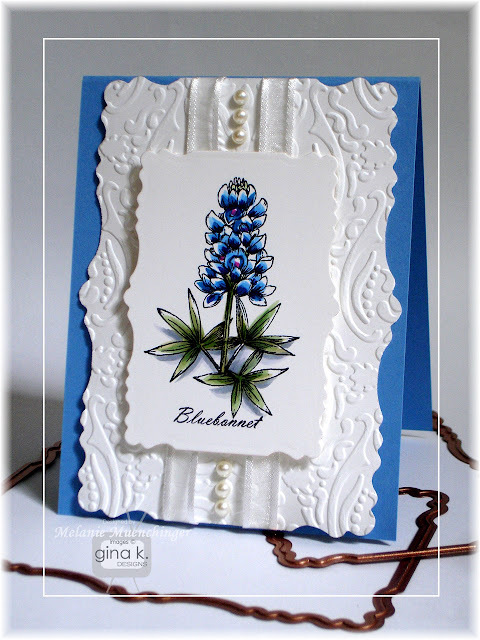 The Design Team for Gina K Designs welcomes you to another blog hop! This time we are featuring the brand spanking new StampTV kit Shine On, whihc is now available for purchase at Gina K. Designs! 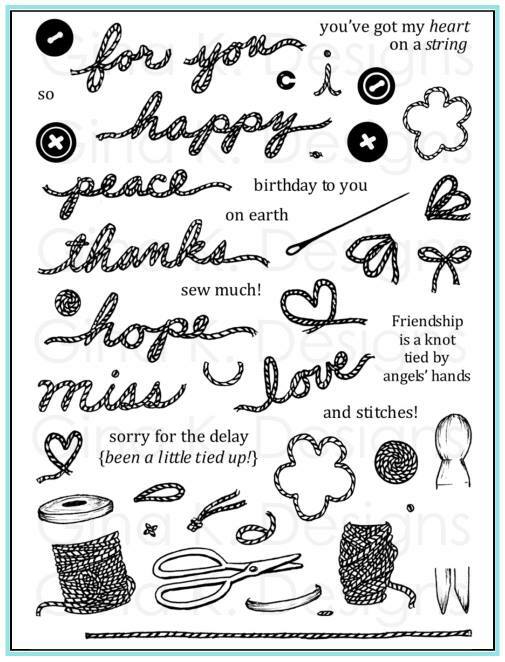 We are hoping to inspire you with many beautiful creations and ideas for this fabulous collection of stamps and supplies! And as you hop along, be sure and comment on all blogs because on Friday we will choose one Winner to win this awesome StampTV kit! 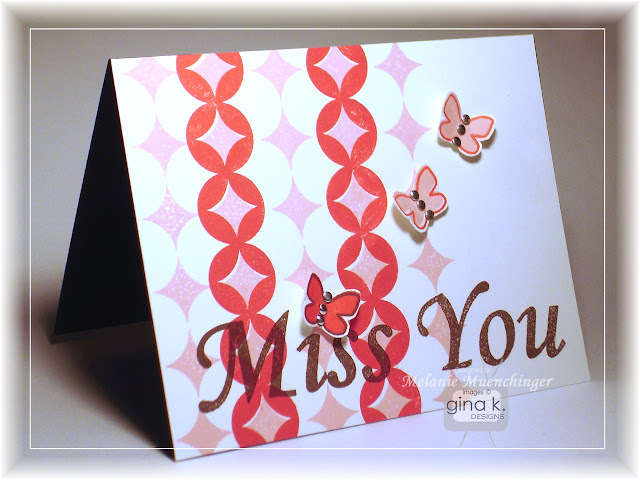 Here is super simple card you can make in 10 minutes that was inspired by the colored dragonflies on a piece of patterned paper in the new Gina K. Designs Spring Parade pack. I stamped them in Gina K. Ocean Mist, Red Hot and Honey Mustard (stamped off shade) I also traced around the dotted line of the biggest image with a black marker to make that detail stand out. Add dimension by layering the largest ones by stamping it again and cutting out just the wings, folding and popping them up with a foam square. I added two silver nail heads to the top and body and accent wings with Stickles or a glitter pen. Draw a simple dotted trial with a black pen. And here is the card I shared on the CardMaker blog last week using the mini Blossom set in this kit. These four mini sets are just adorable! I love love this paper!! Check out all of the amazing creations by the Design team below! 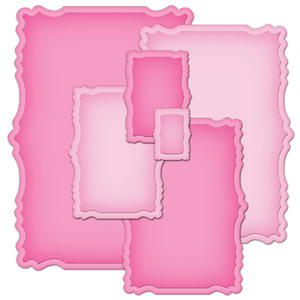 The Design Team for Gina K Designs welcomes you to another blog hop! This time we are featuring the brand spanking new StampTV kit, and we are hoping to inspire you with many beautiful creations and ideas for this fabulous collection of stamps and supplies! And as you hop along, be sure and comment on all blogs because on Friday we will choose one Winner to win this awesome StampTV kit! 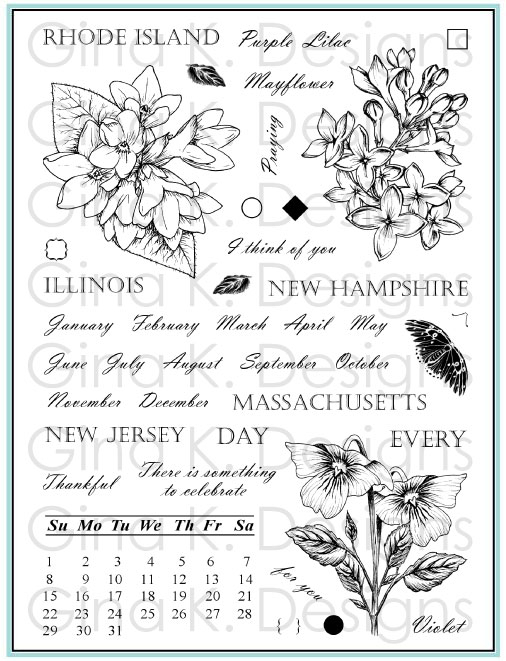 The "In any kind of weather..." sentiment inspired me to make three weather patterns with the stamp images and the different colored stripe patterned papers in the new Spring Parade pack. I placed the mats running vertically for the falling rain, love, and sunbeams. I colored the image with Copics Y35, Y38, YR07, G00, BG23), just be sure to use the Heavy Base Weight White so your coloring won't show through! I used Turquoise Sea and Black Onyx Pure Luxury included in the kit. This kit will be available for purchase tomorrow, enjoy getting more peeks today! 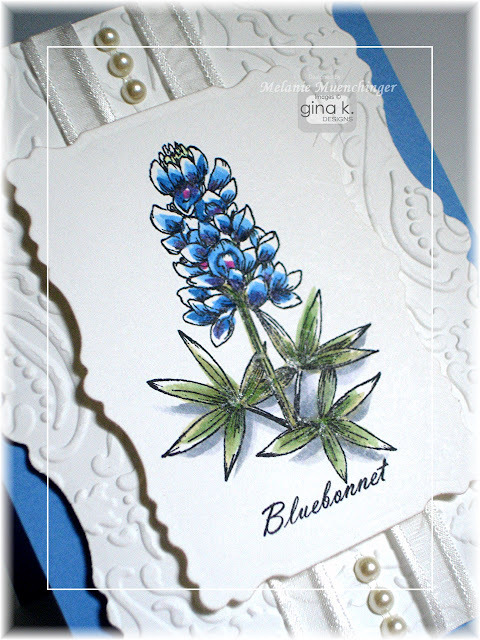 I have an organization tip today on CardMaker blog. Check it out! PS Did you read their post yesterday? I was so surprised and excited to see one of my cards (and a peek of one of Carolyn's!) on the new Quick and Easy Cards Special issue! 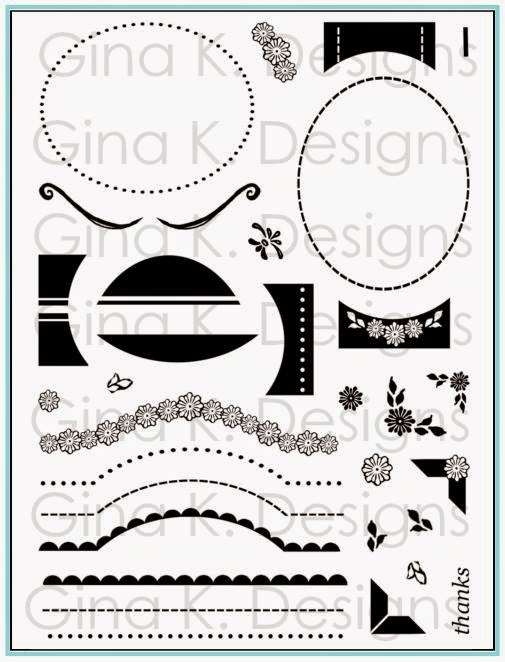 Can you spot and name the Gina K. Designs sets?? please go check the blog and give them a warm welcome! 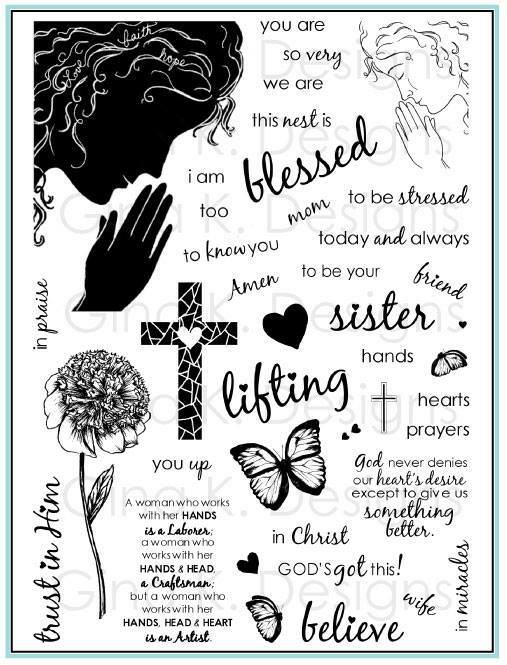 I was honored to be asked to remain on the CardMaker team for another four months, so please continue to look for more of my tips, techniques and designs over there. Coming this Wednesday... a storage tip!